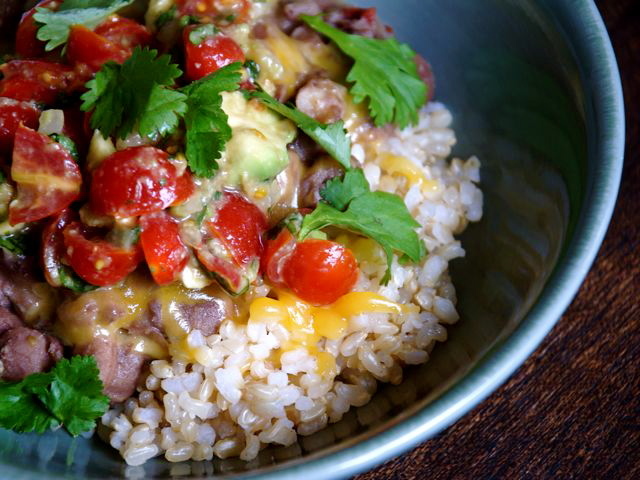 Rice and beans are the focus of a long-time favorite post on Culinate, and for good reason: it's a reliably simple dish that lends itself to interpretation (and the contents of your fridge). When I cook dried beans, I freeze the surplus for future meals like this one. Season the beans to taste with salt and pepper. To serve: Divide the warm rice into bowls. Top with the cooked beans, grated cheese, salsa, and fresh cilantro. Serve with warm tortillas if you like. More often than not, I cook rice by the "boil it like pasta" method: Fill a large saucepan with water and a big pinch of salt, bring the water to a boil, then add rice (I never measure, I pour it from a jar until it looks like enough). Lower the heat to a simmer and cook until the rice is almost done, not crunchy but not quite soft, "al dente" (you have to taste it to know). At this point, drain the rice, then return it to the saucepan and cover it with a lid. Let it steam for five to 10 minutes, then fluff it with a fork and serve.